I don't know when you last took the time to look at the Tallahassee real estate listings that are on the market, but there have been some interesting changes. Values are rising in most price ranges, yet values are falling at the upper end. But those are not the exciting changes. Our graph today shows the status of homes for sale in Tallahassee are much more buyer friendly than they have been in the recent past. If you saw yesterday's weekly special report, then you will appreciate the additional information that this post provides. If you did not, then you'll likely get some information that is contrary to what can be gleaned from the mile high view reports that do not dissect the Tallahassee real estate market in great detail. 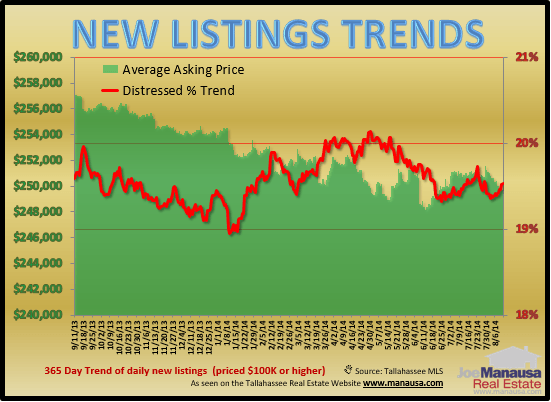 Overall, the inventory of MLS listings in Tallahassee is down 1.2%, yet the figures above seem to paint a different story. The listings that buyers "hate" are those that already have a contract in place with a buyer. Since these homes represented nearly 40% of the active listings (and many failed to close with the previous buyer), homebuyers were pretty much forced to include these homes in their search. That means if you are buying a home, you might find a home that you like, but not be able to purchase it. Bummer! Buyers definitely would rather only look at homes that are not yet under contract with another buyer. Fortunately, the market appears as if it might be moving back to a more normal ratio of encumbered homes versus those that are not yet under contract with a buyer. The numbers from the graph above show that inventory is down 1% since last year, but homes under contract are down over 22%! This means that there are actually more "good" listings out there for buyers to see. If you would like to see all the homes for sale in Tallahassee, just use our free property search tool. It will let you save your search and you can even program the tool to send you new listings that meet your criteria when they hit the market. Our buyers tell us they love it (you will too!). If there is anything else we can help you concerning Tallahassee real estate listings, just drop me a note and we can schedule a time to review your current needs and wants.